The Bio-Energetic Stress Testing (B.E.S.T.) System is a biofeedback device that makes use of acupressure points to assess the functional state of the systems of the body. 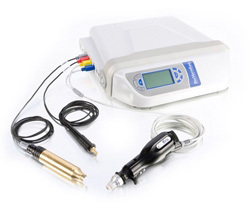 It is non-invasive and painless. The practitioner places a probe on specific acupressure points on the hands and feet, and takes a reading of the electrical resistance of that point. These specific points provide information about the underlying health of your organs, tissues and systems. In this way it is possible to identify stressed or weakened functioning areas. The Biomeridian software installed on the device contains over 40 000 frequencies of products, pathogens (bacteria, viruses, parasites, fungi/yeasts), minerals, vitamins etc. that the body resonates with in order to re-balance the systems. The system may be useful in identifying hormone imbalances, food and environmental sensitivities, and vitamin and mineral deficiencies. One can also use the B.E.S.T. System to gauge the effect that specific supplements or medications have on the body. At the end of the assessment a medication is prepared that contains the relevant frequencies that were highlighted in the testing to balance the body. Biofeedback testing is a tool used to aid a qualified practitioner, along with thorough case-taking and examination.